Developer: Ultra Games/EA. Released: 1990. 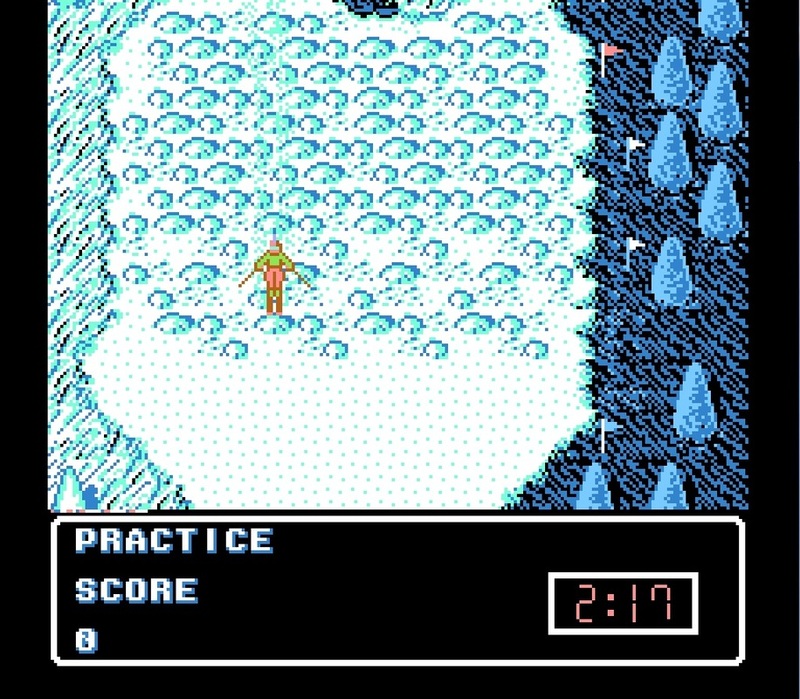 Other versions: AMI; C64; PC. 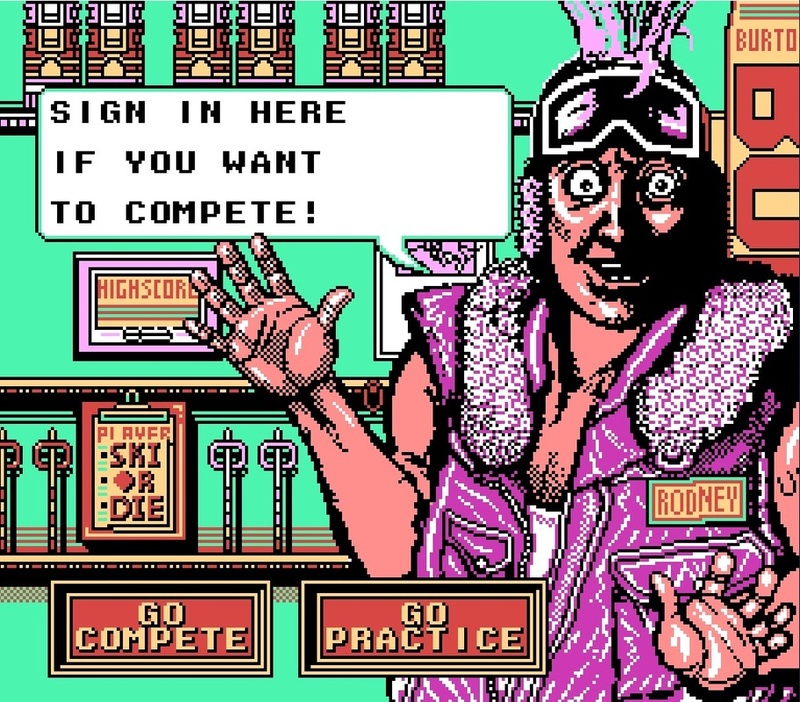 Carried over from the last game is your ‘rad’ host Rodney, who helpfully guides you around the piste to participate in the five events on offer. Downhill skiing, halfpipe snowboarding and acro aerials are some of the more recognisable winter japes. Add to this a daft innertube race and a snowball fight which bears more resemblance to a laser quest shoot, and you have all your events to achieve the highest score possible. This is done by performing tricks, hitting the most targets or by getting the best times. All of these can be done separately, practiced or played consecutively, the final score a tally of all the events. Thing is, there is a feeling no end product, no further stages to compete at, no additional hazards. Just the same stuff repeated over and over. Multiplayer can spice things up a notch, up to six players if you will, but finding any people who actually want to play this even after minimal exposure will be a challenge in itself. A curiously remote Ski Shop. You'd need skis just to get there. 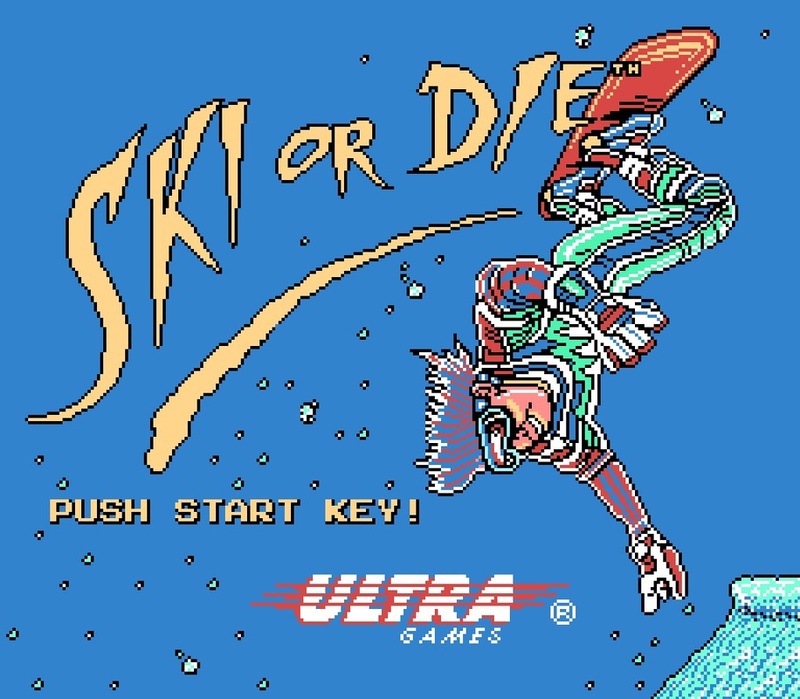 What strikes you immediately with Ski or Die are its overbearing attempts to be thrilling and exciting, as the jolly music and smart title screen would suggest. 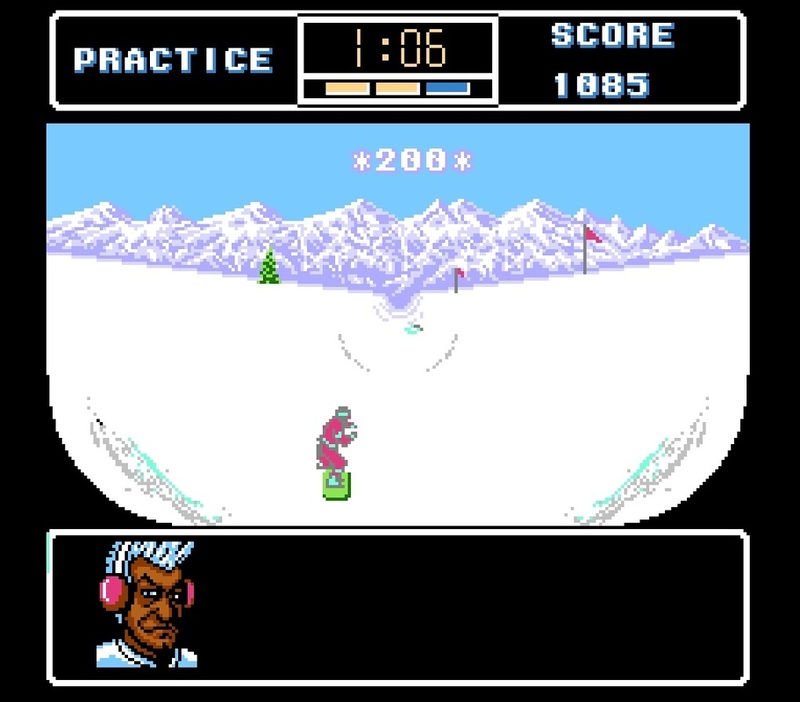 However, once you don your goggles and slap on the thermals, it’s mainly a succession of dull, uninteresting events which leave you with a very chilly feeling, in no way warming up your gaming juices. After a menial amount of play, it’s one of those titles where you have to force yourself to continue on; even though you fear any outcome will still not oblige a hint of fulfillment. If you labour on and dig deep enough into the snow there are a few, very minor fun aspects to uncover, but they don’t last long enough to please. What doesn't help from the outset is a sickly colour palette. Garish pinks, pea greens and vomit purples are not nice. Thankfully however, the majority of the visuals are a mass of light bluish hues and white, and lots of it. Some of the screens can look nicely ordered, the level select is passable and the backgrounds can be pleasant. Very few of the sprites match this already average standard; aside from the halfpipe section, primary figures are blocky and difficult to make out. 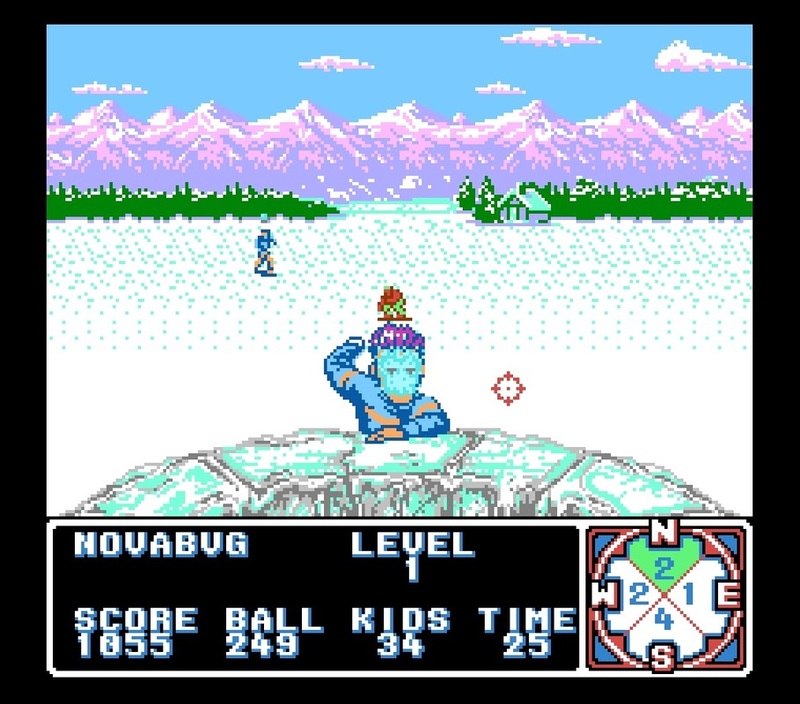 Some of the kids in the snow-fight resemble moving blocks, I've no clue what the obstacles are in most of the games, the paths are hard to determine and the animation across the board is jerky, lazy and stuttered. The audio assistance fairs a little better. The NES gives us some good, non-irritating snappy tunes, hit and miss SFX and some neat soundbytes of sampled speech, the latter of which is the most impressive. It’s again however pretty standard stuff and nothing really memorable or innovative. The BGM of California Games had a ear-pricking quality, as did Skate or Die to a degree, but whilst the sounds are not terrible, neither do they stand out much. This is not the largest snowdrift to plough through however, as what really ruins the wintry fun is the gameplay, or should I say more accurately, the lack of it. Some of which is as icy and as cold as the subject matter. 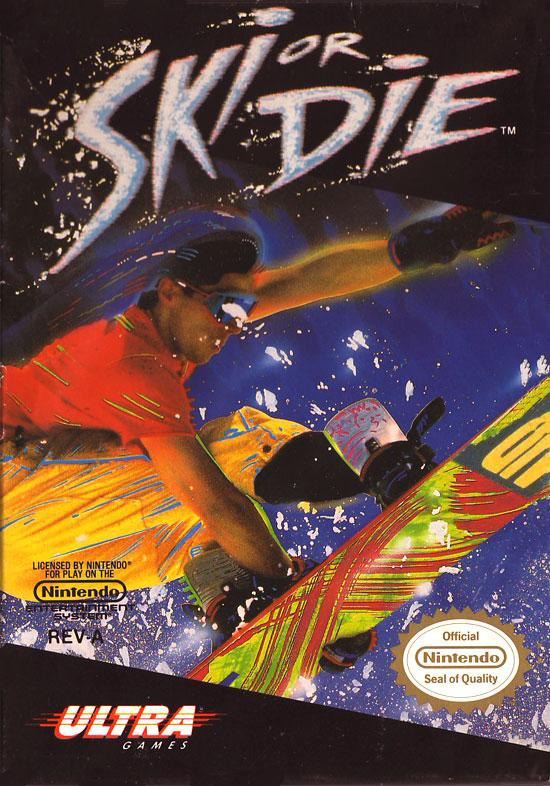 Any kind of player input in Ski or Die is flawed, unresponsive in the main and even perplexing at times. It would be an untruth to say these control and collision problems are restricted to just one or two events as I was desperately hoping; they all have a range of issues, some greater than others. The worst offender is the most traditional event; the downhill skiing. Controlling this is just near impossible as the movements are slow to respond and far too limited to clear the stage without crashing many times. The jump is as random is it could have been and only works at certain points on the course. Coupled with unclear routes, it’s a headache of a task in all honesty. Unfortunately, the unresponsiveness carries through the other events too. The halfpipe can be a little amusing, but again it’s incredibly hard to judge the tricks right, as delays are frequent and inconsistent. The acro aerials are just a shot in the dark, as some commands respond quickly, then delay or even freeze completely, normally resulting with face plant into the white stuff. The pointless and baffling innertube thrash has the same problems as the downhill, just with seemingly no actual goal. 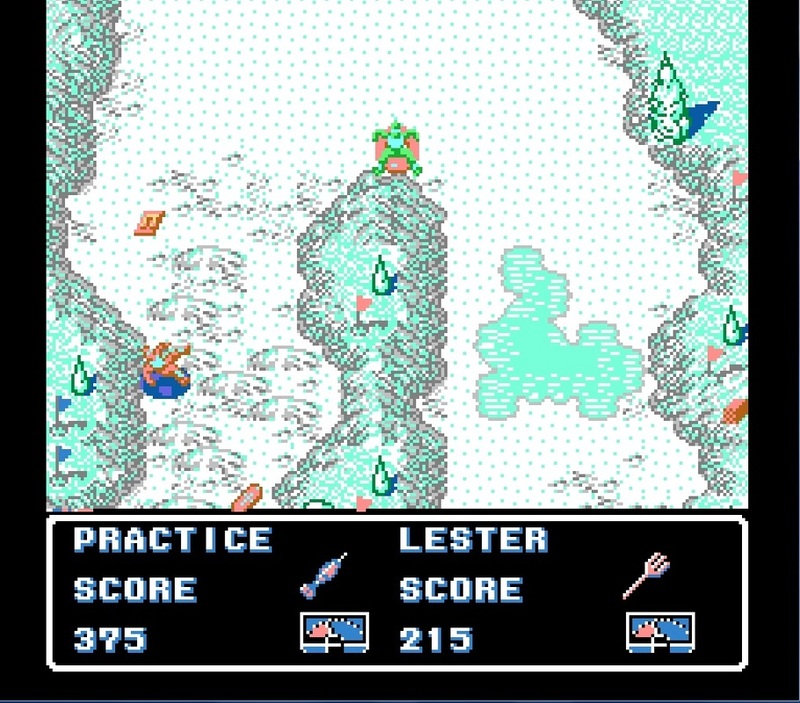 Only the gallery-style snowball fight works sufficiently well to get a smidge enjoyment out of it, but even then some of the collision detection is poor and arbitrary.